Please refer to our stock # 3308 when inquiring. Assyrian Stone Reclining Figure of a Lion, ca. 8th - 7th Century BCE. Carved in frontal relief, 1 1/2" x 2 1/2" x 3/4". Ex: S. Beiner collection, Florida. According to ancient legend, the killing of lions was reserved in Mesopotamia for royalty, and kings were often shown in art doing so. There may have been a religious dimension to the activity. A surviving letter on a clay tablet records that when a lion entered a house in the provinces, it had to be trapped and taken by boat to the king. 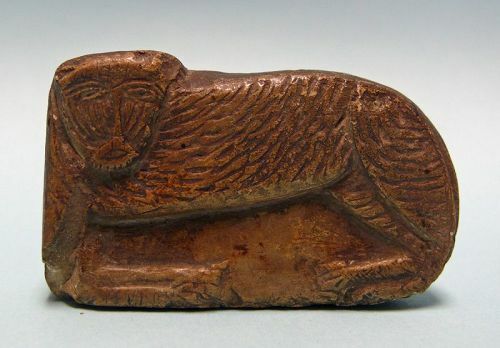 The Asiatic lion, today only surviving in a small population in India, is generally smaller than the African variety, and much later records show that their killing at close quarters, as depicted in the reliefs, was not an impossible feat. When the sword is used, it seems likely that, as in relatively recent times, the actual technique was that "the lion-killer wrapped his left arm in a huge quantity of goats'-hair yarn or tent-cloth" and tempted the lion to attack this, while the sword in the right hand dispatched him. This padded defense is never depicted. More often, the king shoots arrows at the lion; if these fail to stop him and he leaps, the huntsmen close beside the king use their spears.